Okay maybe I have a dirty mind, but when I read 5 different articles that all say Anthem has "Performance Problems", I don't immediately think frame rate, lag spikes, and controller response consistency issues. My mind goes to an entirely other comical place smelted in the fires of Rom Coms, and men's health ads. ...pation, there is little room for player displeasure when the reviews and streaming experiences start rolling out. 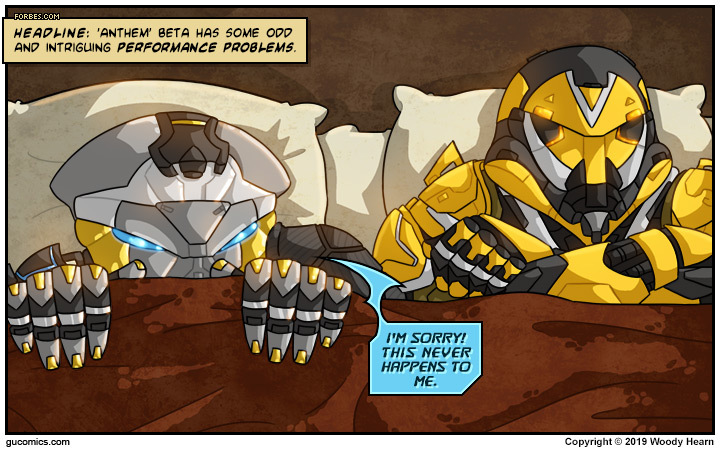 EA/BioWare has (as of the time of this comic) about two and a half weeks to get it straightened out, or to make sure the Anthem community is well aware of a viable work around. Let's hope they can get it up to expectation by the 22nd. Innuendo offered without reservation or remorse.